So what’s all this business about a headless chicken? Well in 1945 a Utah farmer cut the head off a chook that was meant to be dinner and sans head it lived for another 18 months. Miracle Mike as he came to be known travelled the carnival circuit around the USA earning his owner the equivalent of a staggering $50k a month in today’s money. Inspired by the fun and freaky fame of this crazy creature the Young Guns named their Scout in his honour and made up a race plate with the number to commemorate how many months Mike made it without a head. Now all they had to do was take a big and bulky Yankee Cruiser and turn it into a machine with genuine sports bike performance, easy right! “We wanted to build a bike which can keep up with serious sportbikes like the BMW RR or other sportbikes but still use the original frame and engine,” explains Nik. Oh…, so they’re not joking! 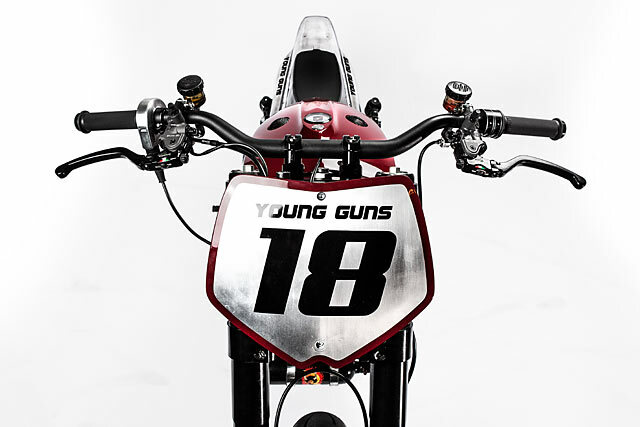 Despite the enormous task ahead of them and with the pressure of working for one of the biggest motorcycle companies on earth hanging over their heads, the Young Guns remained totally confident. With the contracts signed and the brand new Scout sitting in front of them the tear down process began in earnest. Saving weight is easier than making horsepower, but this build would require both to deliver bulk performance. The stock tank was pulled from the bike and totally gutted, it would no longer hold the go juice and was narrowed by 12cm. Immediately this saves weight and gives the bike a more svelte look that carries on rearward. 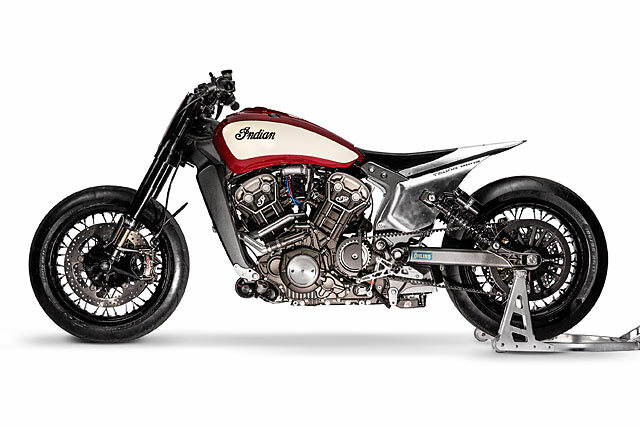 The entire subframe is a YGSS creation that was modeled on Nik’s KTM dirt bike. The seat continues along the dirt bike theme with the custom trimmed piece finishing out in a sharp alloy tail. But it’s what lies beneath that is key to transforming the Scout and helping to get the power down to the ground. Shifting the weight closer to the rear wheel, the YGSS fabricated a custom alloy fuel tank that can be filled by lifting the seat. With considerably less capacity required to run the strip there is also room for the battery, all hidden by the two alloy side covers. Left in bare metal they make for a beautiful contrast with the classic Indian colour scheme applied up front. So far the weight was coming off and things were progressing smoothly, but while the boys worked on the chassis they sent the engine out to horsepower gurus Swissauto. The 69ci American muscle makes a lazy 100hp from the factory and this would need to be near doubled to get the job done. 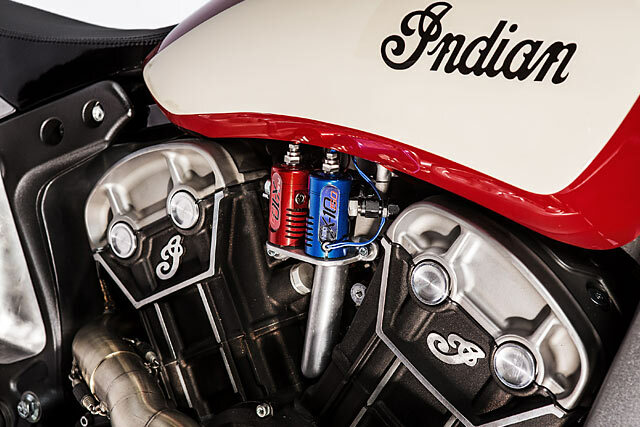 With YGSS wanting to run nitrous the engine was built with giggle gas in mind, solid internals, high flowing heads and precision engineering. To improve cooling and save weight a friend of the shop fab’d up an alloy radiator while the Young Guns made the custom piping to fit. With the engine back from Swissauto and in the chassis the exhaust was mocked up with careful consideration given to the location of the O2 sensors; precise tuning being vital to the final product. 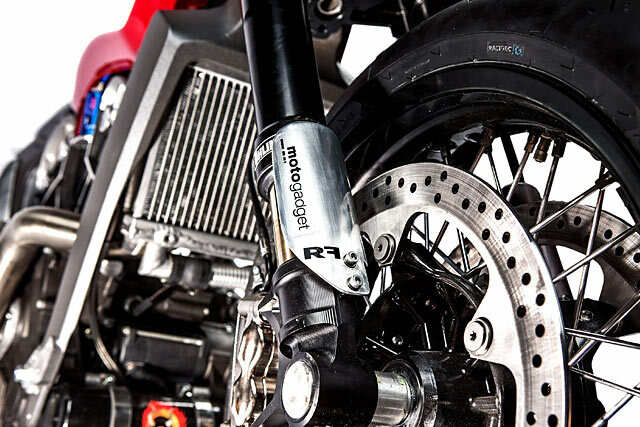 The system itself saves a chunk of weight over stock and flows considerably better with the finishing touch a very sportsbike like Akrapovic muffler. To finish out the fuelling system Wizards of NOS supplied one of their wet nitrous oxide systems that delivers both the N2O and extra fuel to prevent catastrophic lean outs. Confident the power was heading in the right direction more weight saving and increased performance was sort elsewhere. The suspension was the first port of call with Ohlins coming to the party with their latest USD forks that are secured in place by an LSL upper clamp. This required some YGSS fettling to bring it up to their satisfaction before a set of LSL bars could be fitted up. 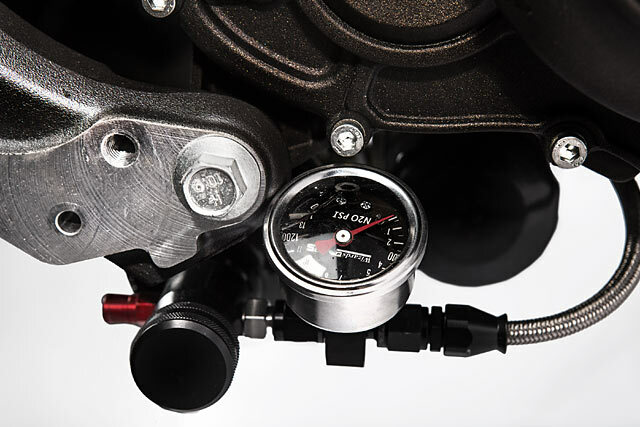 A quick action throttle gets the nod, while a hydraulic Magura lever combo sends power to the new Brembo brakes. Out back an Ohlins shock makes dialling in the bike a cinch, but the burden of the stock wheels on the bikes unsprung weight called for a change. 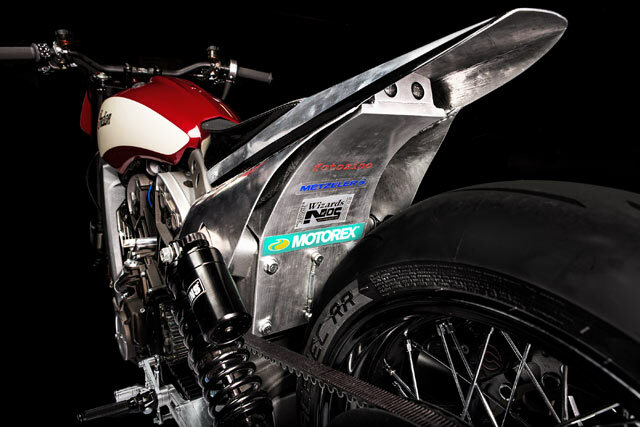 The rear starts with a stock Scout hub that has been laced to a lightweight Excel Supermoto rim. With the front wheel coming from an R90, both measuring 17 inches they wear sticky Metzler Racetec rubber. 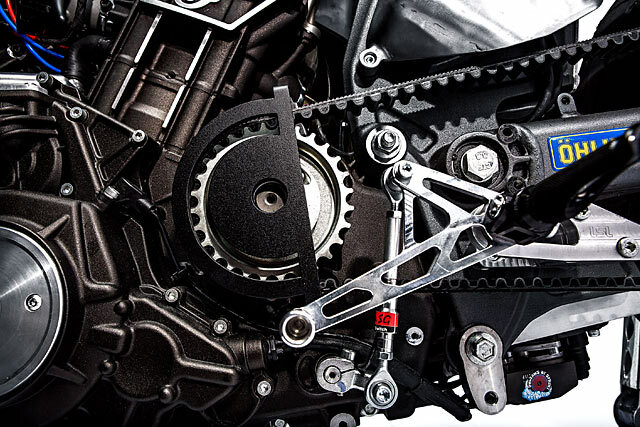 Sadly aftermarket parts for the Scout are not overly tailored to the performance side of things so the Young Guns fabricated their own rearsets that work with an electronic quick shifter for ultra-fast gear changes. But this was just the start of the wiring headache to get the bike finished, including the retention of the complex CAN-bus system. The decision was made to start from scratch while using as many Motogadget products as possible both to simplify the layout and further save weight. 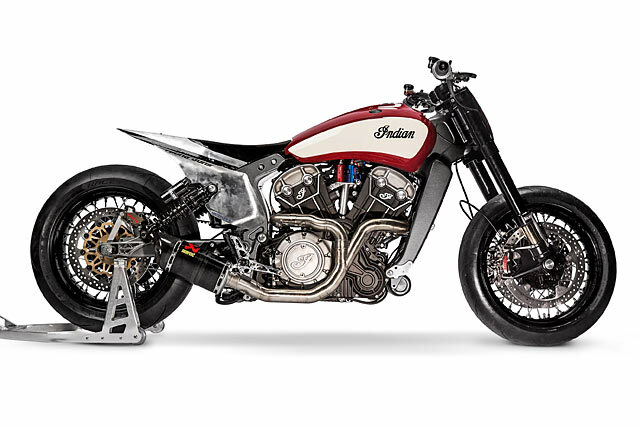 The majority of the loom is now hidden under the shell of the original fuel tank, with many phone calls to Indian’s parent company Polaris required to ensure everything worked as it should. 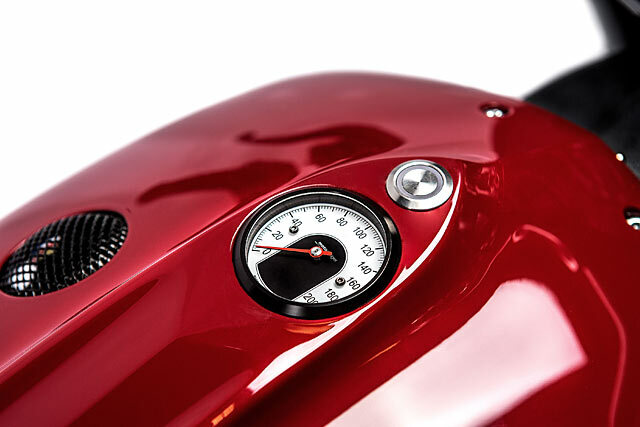 A Motogadget analogue speedo was mounted in the top of the tank along with a brushed alloy start button to get the chaos to commence. On the scales the Scout had shed nearly 50kg with a final weight of 198kg fully loaded with just the engine tuning to go. Swissauto’s rolling road was chosen with 150hp achieved before clutch slip intervened. A little work more and two solid days of power runs resulted in a mammoth 185 ponies at the back tyre. Accounting for drive train loss that’s an easy 200hp at the crank and the first Indian Scout to reach the magic 1:1 power to weight ratio. Arriving at the Essenza sprint races the YGSS pulled a swifty on the crowd putting former 250cc GP rider Katja Poensgen in the saddle. She blitzed the field destroying all comers, earning Indian and Young Guns Speed Shop the top trophy and once again Miracle Mike had all and sundry running around celebrating like headless chooks.